Basically the weather here is very predictable. There is a south-east wind, nil to light in the early morning but it becomes quite windy, 12-18 Kts at some stage between about 9 and 11. Not ideal for all day flying, but none the less a more or less guaranteed three to five hour window to fly in each day. Coastal very kindly let me keep the FIB fully rigged in their maintenance hangar overnight so there was little effort to get ready for the flight to Zanzibar apart from leave all my stuff on a trolley to be collected by Teddy Junior for transport to Zanzibar. Just in case it didn't arrive the same day, Coastal also sent a small bag over on one of their flights with a change of clothes and things. Eve and I took off from Dar airport reasonably early and cruised across to Zanzibar at quite a decent speed, something around 45 Knots, so a 10 Knot tailwind. I thought it would take about an hour and a quarter, it took less than one hour. Two up and full fuel the performance of the FIB is such that once we were clear of the airport the climb out over a very built up area of nothing but tin roofs and the occasional dusty football ground in medium turbulence was a bit scary until we got some reasonable height, but once we were over the sea it settled down, I throttled back into a cruise, hauled the wheels up and relaxed a bit, 582 thundering away behind us. Slightly mysteriously, my GPS dropped out for ages, I maintained more or less the right compass heading. Eve said the Dar zone ends at the Cement works so when it was more or less abeam I called to say we were leaving their zone and they told me to switch to the Zanzibar frequency. Luckily, before I was asked me for an ETA (and there was a lot of traffic, so an accurate one was important) the GPS was back up and displaying it so I didn't start having to do complicated calculations (or more likely, as we were over the sea, some sort of guess) after all. In the middle of the 45 Km channel we could see the mainland and Zanzibar quite clearly so there was not much chance of flying blindly out into the middle of the Indian Ocean until we ran out of fuel, in any case it is quite a big island and we would have had to be wildly off track to miss it, and of course there was the constant stream of Cessna Caravans to follow, extra traffic laid on for people wanting to get to Zanzibar for Eid El Fitr which we'd heard had definitely been declared before we left Dar. 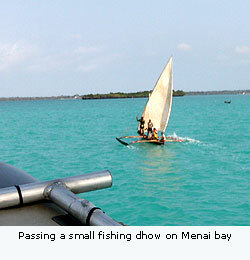 Zanzibar radio, like Dar, were very difficult to understand. The tone in my radio intercom is a bit too bass for deep voices to be heard clearly; after each communication I had to have a bit of a discussion with Eve about what they said, each time we came to some sort of agreement and I then replied appropriately. In comparison, I had no trouble understanding calls from other traffic. Anyway, We crossed the coast and decended into Zanzibar to land on runway 18 without causing any trouble and taxied between a large array of parked aircraft to stop in front of the main terminal building. It is definitely much easier to control on the ground since I cleaned out the brakes when I was assembling it this time in Dar, or perhaps I'm just getting better at pursuading the unique fully castering nosewheel of the FIB to do what I want, probably a bit of both. Quite a crowd of people appeared from their offices to stare at the strange Ndege-boat thing which had arrived. Ndege is Swahili for a bird, or an aeroplane. When asked, Eve said it was one of her more interesting flights, quite wobbly, especially at the beginning, before we got to the sea. The crew were all there on the apron waiting for us. Thomas Wartmann, producer of the whole series and Director of this episode, Marcel Kolvenbach, our local fixer; a German who lives in Uganda, Jörg the cameraman, Stefan on sound and of course Matthias, the photographer who is my co 'protagonist' for this episode. Next to the apron is a large hangar which I think belongs to Zan-Air but it is empty apart from some kind of twin engined aircraft and Cedric's microlight. I taxied round there. The twin had a nosewheel collapse on takeoff some months ago which had left a large hole under the nose where it had ground along the runway and bashed both propellors with consequent engine damage; Cedrick told me it was probably written off. Cedrick Mottequin is a Frenchman who had been in Reunion for a few years before moving here to start up a new business in virgin territory. I give him full marks for tenacity because it took him more than two years to get the permissions but he's now well established, is very competent, and seems to enjoy the confidence of the people running the airport. Important I don't make a mess of things then, it could reflect on him. I forgot to ask him what his aircraft is, I'm not very good on three axis types, but I dare say people will tell me what it is from the photos, but it's a taildragger with the French blue 912 in it. In the hangar he has a pair of aluminium floats complete with retractible undercarriage system built in. They're no good for his current aircraft but soon he's getting a version of the same aircraft with a bigger wing which he says will be better for training, and these floats will go on that. The film crew immediately wanted to start work by filming me taxiing around the apron between all the parked aircraft for the cameras. I hoped the indecision about what I should do wasn't a portent of the future, I said I would do this, and did it. Not good enough, do it like that. Why couldn't you do it like that? (A: because the space between two big aircraft is too small, and that big one over there was starting up - see?) OK - so do it again like this, and again, because we didn't get it the first time... This sort of thing is really very dull as it makes me look stupid in front of other pilots and the airport people. After that we fitted some Go-Pro HD cameras to the wing, made a plan with Cedrick for tomorrow and headed off to the Mtoni Marine Hotel for supper. Next morning, early, we were back. 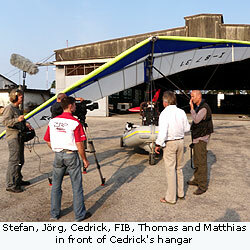 This was Matthias' first flight in a microlight, we were to fly south to Menai Bay in company with Cedrick who had Jorg hanging out of the side with a big camera. A bonus would be if we saw the Dolphins, or even a whale that are sometimes there. Just to make things complicated, Thomas briefed us that according to the script this was actually nearly the last flight of the journey so we had to say various things to each other which was recorded as if we were coming to the end of the trip. I started up ready to go. As quickly as I got permission to taxi, it was withdrawn. "You do not have permission to fly" said the tower. I switched the engine off and Marcel went to see what the problem was. 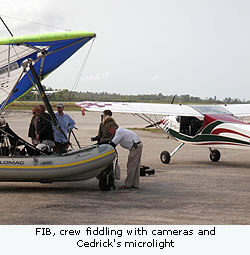 It turned out that Cedrick is allowed to fly in the local area without a flight plan because he's in a locally registered aircraft but I am not, and must make one. In retrospect, I should have gone over to the tower too because Marcel had no idea what a flight plan is or how to fill one out, and not being a Ki-Swahili speaker wasn't able to make a joke with them about the whole thing and just got them in a fluster. However, eventually it got done and we set off. By this time the wind had got up and it was quite rough in the climb over the land, Matthias sounded like he was enjoying it, I kept fairly quiet thinking it would settle down once we got over the sea, which it did. We flew around for quite a long time at low level past various small dhows out on the bay, I thought Cedrick was being rather brave when he came past me a couple of times at about 20 ft above the water, 912's are reliable as anything, arent't they? OK, so I've got a two stroke 582, but I've got a boat as well. We saw no dolphins, or whales, and returned to Zanzibar airport, for a first flight I though we'd done quite well and Matthias seems to think it's great, though not much good for taking photos from, and Cedrick was happy . They wanted me to do some more stuff but not until they had done a considerable amount of frigging around looking at the shots we'd got, listening to the sound and stuff. By that time there was 12-15 Knot crosswind, "Is that too much?" they asked. I said yes, and it will be as rough as hell along the coast in front of Stone Town where they wanted to film next because it's downwind of the main body of the island, so useless for air-to-air shots as we'll be bouncing all over the place. They sounded disappointed, but we gave up for the day. This evening we're going to some sort of concert, and tomorrow we're supposed to be flying up to Nungwe at the northern tip of the island to land in the sea 'amongst the dhows', but for some reason Marcel thinks we don't have all the necessary permissions yet and the chap who can give them won't be back until monday, if we're lucky, because it is likely a lot of people will still be celebrating Eid el Fitr then. So we've got at least two more nights in the rather comfortable Mtoni Marine Hotel.